Grand Alchemist was created late 1995 and is located in Holmestrand, Norway. In the autumn of 1995, the long-time friends Sigurd and Stoelan started rehearsing together, and they soon found out that this was something they could go further on with. The band's name back then was Morrheim. In the autumn of 1996 they recorded their first demo called "The Midwinter Frost". At this time Kim joined the band on guitar, and in the spring of 1997, the second demo - "Forever Night Infinity" - was recorded. Morrheim changed the name to Grand Alchemist in the spring of 1998. The new songs for the third recording were completed , but for some reason, no demo came out, and almost all of the the material was erased. 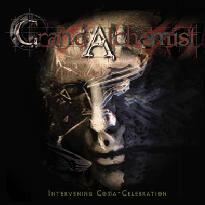 The next year was used to work on new songs that gave Grand Alchemist a more complex and unique sound than before, and at the end of 1999, Grand Alchemist had come through with six new songs in "Studio Elg", Holmestrand. Kim left the band in 2001 because of some disagreement with the other guys. Terje replaced him on guitar, and with his guitar-skills he contributed in developing the sound even more. Roland joined the band on bass shortly after Terje. In November 2001, the new line-up recorded "A Nailed Visual Effect" and "Approach (Open The Shell)" in Studio Elg, songs that expanded the band's sound even more. In February 2002, Sound Riot Records came in touch with Grand Alchemist, and wanted to sign the band. After one month with a lot of rehearsing, the guys went into Studio Elg and started the recording of their first album, Intervening Coma-Celebration, with Rune Thoen as an engineer and co-producer. He had worked with the band before, and was familiar with their sound and way of acting (up) when recording. After over a month with recording, mixing and arguing, Grand Alchemist could finally let Tom Kvålsvoll at Strype Audio master the album. The album contains 12 tracks.